American aviation and motorcycling pioneer (and a certified badass) Glenn Curtiss set the unofficial land speed record of 136.36 miles per hour in 1907 on a Curtiss V-8 motorcycle. 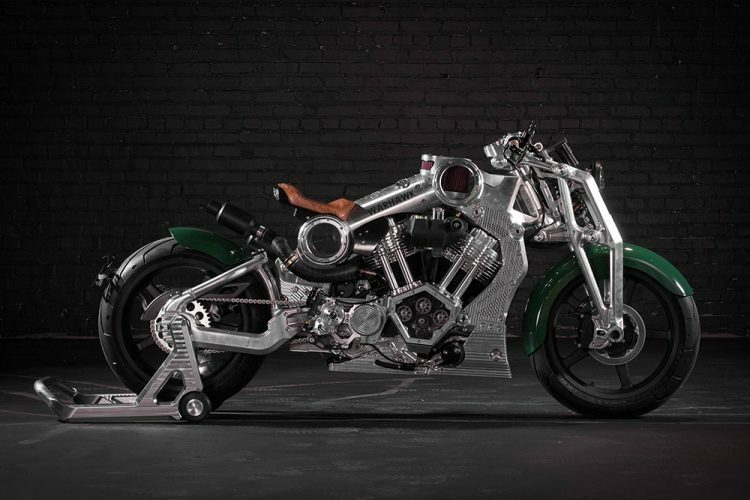 More than a 100 years later, the revived Curtiss Motorcycles company is coming out with a motorcycle – the Warhawk! There are going to be only 35 models made, and one will cost $105,000 when the revival of Curtiss Motorcycles officially begins on May 5th of this year. You can leave out your expression of interest at the bottom of the official Curtiss Warhawk webpage. Seat height of the very steam-punk looking aluminum frame motorcycle will be 29.5 inches, while the air-cooled 2200cc V-Twin will allow the bike to travel up to 165 MPH. The 5-speed Curtiss stacked gearbox and fuel capacity of 3.75 U.S. gallons will ensure the longer and more intense burning of the Michelin tires. Check Out the Five Fastest Motorcycles In the World.